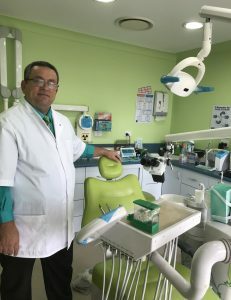 Dr Saad Yousif is a General Dentist With 29 Years experience in Dentistry.He committed to provide you the highest standard of personalized and modern dental care, as he provides exceptional dental care for people of all ages. In Bright Dental Care Dr Yousif is practising a dentistry with the latest techniques in all fields, like Root Canal Treatments, Crown and bridge works, Dental Implants, Laser Dentistry, Filling, Teeth Cleaning and Whitening and more. He provides exceptional individual dental care for you and your family. We use all the latest technology in treatment like the Digital x-rays that help in diagnosis and treatment of all dental needs, please visit Our Technology page on this website. Give us a call on (02) 87860522 so we can set-up your first appointment free with Dr Yousif for a general Check-up and discuss all your needs. All the treatment options and the reasonable coast for your dental treatment needed will be explained to you in a very simple and technical words . Dr Yousif , beside his English language, speaks Arabic, Chaldean and Assyrian languages, and he have been a university Teacher for 14 years back in his home country. Patients with Private Health Fund enjoy the value and the convenience of instant claiming with a little or no Gap payments. We bulk bill for Medicare Child Dental care program and accept all form of Cards Payments.